I live in Lisbon, Portugal and had never really had any contact with pigeons who weren't scared of humans (in my neighbourhood they fly away if you get within 2m), so you can imagine my surprise when a couple of weeks ago, as I was standing by my window (I live on a 3rd floor), a pigeon comes flying and perches himself right next to me, looking at me curiously. I found that fearless pigeon incredibly amusing, so I grabbed some bread that was laying around and fed him the crumbs. As I closed my window I honestly thought that would be the end of it, but to my surprise the little guy has kept coming back every day since, and sometimes stays perched outside of our window for hours at a time. He's really funny, and demanding: when I have his bird feed in my hand and am not feeding him fast enough for his liking, he actually starts slapping me with his wing, the little Illegitimate squab! Suffice to say, me and my family have grown attached to him :). I actually have three cats in my apartment (and two Java Sparrows and a tiny frog but those aren't relevant to the discussion ), and we're a bit concerned about the diseases our cats may get from being close to the pigeon, especially the one that likes to watch as I feed him. The pigeon had this fly on him, the so called Pseudolynchia Canariensis I believe, that flew in my apartment and disappeared. A day or so later I saw one of my cats (the watcher) twitching as if something was itchy, and saw the damned fly on the floor. I killed it but am concerned about the possibility that these flies can transmit diseases to cats, as I believe I've seen another one on the poor pigeon. So, is it dangerous to have this cat so close to the place where the pigeon feeds? Can she get any diseases from him or the flies? Hello Nilay...that's a good question you've asked.I don't think you need to worry about your cat getting sick from the pigeon fly. It's always a good idea to use a monthly flea remedy, such as Advantage, for your cat which should also kill any flies. It would be a good idea to pick up a lice a mite spray, from a pet shop, to have on hand should you find a fly on your Java Sparrows. It sounds like your new pigeon friend is quite a little character and will provide you and your family with hours of entertainment. Probably, he would enjoy some dove mix or wild bird seed, which you may also be able to find at a pet store. Pigeons absolutely love bread as a treat but it contains little nutritional and feral pigeons often have trouble finding food that keeps them healthy. Congratulations on your new friend! All the best to each of you. Hello Matilda, thank you for your answer! That’s a relief to know, but what about diseases that come from the pigeon itself and not the fly? Are there any, or are they irrelevant if the cats have taken their vaccines? As for the feed, as soon as I understood he was going to be a regular I got some dove mix from the pet store. Which actually reminds me of another question…What quantity should I be feeding him? Because if I keep giving him food, he just keeps on eating it. It’s very hard for me to tell whether he’s doing it because he’s hungry or if he’s just being greedy. A bigger worry is that the cat will scratch the pigeon. Many cats have bacteria on their claws and teeth with is deadly to birds, so do take care the pigeon is safe from your cat. Generally, pigeons eat morning and late afternoon. They fill up at each feeding and wait until the crop empties until eating again. The pigeon will stop eating when he has eaten enough to fill himself so allow him to eat his fill. As Charis said, you don't need to worry about diseases that pigeons might possibly transmit to your cats, as the simple answer is that there is not a single pigeon disease that cats can catch. I have 3 pet cats and 9 pet pigeons (plus a dog and a swift), and no problem! The boot is on the other foot, really, in that the bacteria that can be present in the mouths and claws of cats (and sometimes dogs) can kill a pigeon in 72 hours, even if the injury is only a tiny scratch or bite. Having said that, my vet informed me that Pseudomonas, the most dangerous of those bacteria, has not been detected, even in feral cats, here in Portugal for many years -- but it's always best to play safe! As for humans, there is one disease we can catch from pigeons, which is like a heavy cold. This disease is Ornithosis (also called Chlamydiosis or Psittacicosis), and it's very obvious when pigeons have it, because they have runny eyes and nose, and sneeze a lot. Naturally, this information is not good for extermination companies. In order to ensure their livelihood, they will tell you the most extraordinary tales about pigeon diseases, knowing that public alarm and hatred of the humble pigeon will keep them in business! They will refer to the disease I mentioned by its 3 different names, pretending they're different diseases, and go on about the dangers of moulds that live in pigeon droppings (and on any other organic-rich substrate in the universe), as if we were in the habit of eating the stuff!!!! It's refreshing to come across someone like you who will check things out for herself and make her own mind up! The flies you described are just my pet hate!!! Unfortunately, the unseasonal hot weather this autumn has kept them alive much longer than usual -- and in great numbers! I've had them come into the house through open windows, and attack my pigeons, and cats, and the dog too! They are all protected against those pests (Beaphor Spot-On or Ivomec for the pigeons, Advantage for the cats, and Advantix for the dog) but the blighters still get a couple of good bites before the meds kill them... thankfully they don't bite us, as our body temperature is too low for their liking. We can see them on the pigeons (because the pigeons come closer to us), but they can be present in any bird. I wish I knew a way to destroy them all, but I don't. Hopefully a few really cold nights will do it, and soon! Your guest sounds like quite a character! I think it's fair to say you can expect to see him every day now... They can even learn to come at a precise time each day, but of course they'll be an hour out when we change back to summer time! Outdoor pigeons tend to eat more than indoor ones. They exercise more, for a start, and they have to compete for food with the others. For this reason, they may try to stuff themselves with food by gobbling it down very fast, but they won't eat more than they can handle. As a rough guide, each of my regular visitors gets one scoop (meaning as much as I can scoop with one hand) of pigeon mix twice a day. Sooooo... have you chosen a name for the pigeon yet? Please keep us posted, I'd love to hear more about him and your other pets! Thanks again for your answers Matilda and Teresa. My brother is kind of a “disease freak”, and had already been giving me an earful on those pigeon flies and how they transmit diseases. I did my own research and from what I could gather, those flies are more harmful to the pigeons themselves than anyone else… But I wanted to know more, so I found this forum and decided to make a post here so you ladies could enlighten me some more :). As for my cats, it’s actually pretty funny to see… Two of them don’t really care. They might watch for a minute or two and then turn their backs and leave for some cozier place. The third and youngest (she’s about a year and a half) comes running every time she hears me open the window, as she has learned to associate that sound with the pigeon. She sits behind the window glass (as the window opens to the inside), on top of our clothes washing machine, and watches very intently. So there’s always glass between her and the pigeon. She acts all tough when she’s behind the glass, trying to touch the pigeon (but doing so on the glass, obviously), but when I grab her so she can watch him without glass between them, she goes incredibly passive and even afraid, and ends up trying to wriggle out of my grasp so she can position herself safely behind the glass again. I never leave that window open without supervision anymore though, better safe than sorry. As for the feeding, I usually give him a little over two scoops (of my hand) myself, so I’m glad I’ve been doing that right :). I’ve been saying “him” but I don’t even know if it’s a he or a she actually, is there a way to tell? And I should actually be saying “them” by now, because I have two fearless visitors now . I haven’t named them yet so I’m very open to suggestions! Since I don’t have any videos of the two little guys yet, I thought I’d share a little youtube video of two of my cats! The blue-eyed one is the “watcher”. I actually have a few more questions but I'm done with the wall of text for now! I should actually be saying “them” by now, because I have two fearless visitors now . You open up a pigeon restaurant... you get customers! It's really difficult to tell the males and females apart, and all of us here have made spectacular mistakes in the past! But it's usually the males, and the dominant males at that, that take the initiative to explore new territories and food sources. Ultimately, you can be absolutely certain that a pigeon is female when she lays eggs, but other than that there's always some measure of guesswork involved! ... especially the spray in the last photo, as it was bought at a pet shop here in Fishville, so you'll definitely be able to get it in Lisbon! That's the only insecticide that my cats and I aren't allergic to, and it's the best weapon to have at hand against the pesky things! I can understand your brother's worries... pigeons have a bad reputation, poor things, but it's really only the flies that are a major problem, and they will appear whether there are pigeons in the vicinity or not. The first time I saw them was during the summer in Glasgow, inside the flat, and we lived a couple of blocks away from the nearest park or the nearest pigeon! PS. Ask anything you like, walls of text are very welcome!!! Pigeons are fairly easy to tell apart. When they become mature. U can very gently place ur finger resting where the egg comes out. underneath the bird. There should be two Bone placements. If they are apart a egg can come out. FEMALE!!!. lol. and....Males the bones are together. Fairly easy I have made a phew mistakes in the past doing this. but most of the time it works! I will display two pictures. Very cool! Thank you for posting these diagrams, Splizzlah! I only knew these diagrams as referring to Ornithischian and Saurischian dinosaurs, I had no idea they could be used to distinguish male and female pieons! You mean that's from a dinosaur? well it aims pretty much exactly what im talking about. But yo we may have just discovered something here. 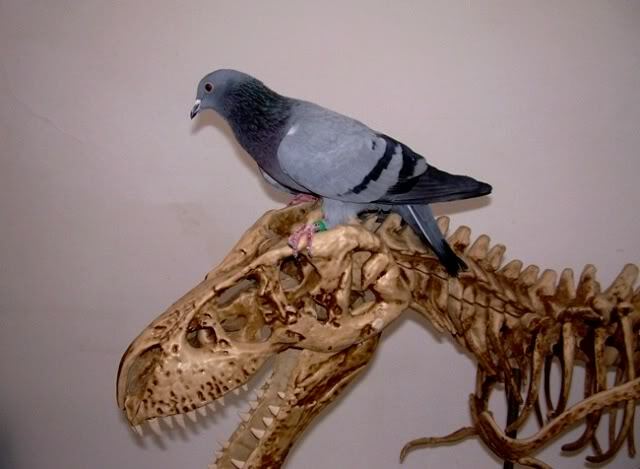 I always knew birds were in the prehistoric times. But now you mention this is actually from a dinosaur diagram. I am almost certain that birds are from the prehistoric times. Thanks for all the info on how to tell whether a pigeon is male or female, but my two visitors are still too feral and don't like being touched. Hopefully that will change in due time! Unfortunately I've been having some issues with the two of them...The first one is very territorial (probably because he found this food source first?) so whenever the second one is around and there is food involved, they get into a fight. At first the 2nd pigeon didn't respond, even though the 1st was pecking at his neck, but today they got into quite a nasty fight. Because I live in an apartment they quickly got out of my reach, so I couldn't do anything to bring them apart... Luckily it only went on for about a minute but I really hated seeing them fight like that. It's not like there isn't enough food for both of them. So, the 2nd pigeon was not aggressive from the start, he...(he's looking at me right now from outside the window LOL)...well he just wanted some food, but the 1st wouldn't have that. What can I do about this situation? Any help would be appreciated! PS: I definitely need to name them...All this "1st pigeon" this, "2nd pigeon" that seems very impersonal. Nope!!! And to prove the point, after a cursory investigation she usually poops on poor T-Rex! You're quite right, the first one is claiming the new food source as his territory and trying to discourage competition. The second one is either hungry enough to run the gauntlet, or else he could be a contender. Pigeons, especially male pigeons, fight as a means to establish... yes, a pecking order. Most people don't interfere with their squabbles, as by the time the fight finishes they've come to some sort of understanding and will respect the hierarchy. I find it hard not to interfere though, especially when they get a bit vicious, or one of them is very young. So if I'm trying to feed two pigeons on the windowsill I put the two scoops of food at opposite ends, to leave enough of a gap between them. So is it safe to say they're both males then? I actually had been doing what you said, feeding them on opposite sides, but Titan (1st pigeon!) would have none of that. He'd go out of his way just to kick Road Runner (2nd pigeon) out, spilling all the food in the process! But it looks like they came to some sort of agreement after that nasty fight because they aren't acting as aggressively anymore. I usually supervise them just to make sure though, and flash some more food when it looks like Titan is about to start a fight. Still, I hope this peace lasts. I actually called the 2nd pigeon Road Runner because he does an incredibly funny "meep meep" noise when being threatened by Titan! Titan and Road Runner! Excellent! Love the name Titan, especially... I've come across so many pigeon names, but never a Titan! My bossy boy is called Hercules, and he is Piper's mate. Yes, most likely your two visitors are both males, but some ladies can be pretty aggressive and adventurous too, so it's not 100%! But I have some interesting news for you: that meep-meep sound is characteristic of a squeaker -- in pigeon terms Road Runner is just a young child! Squeakers need lots of food at this stage of their development, so they are very competitive and insistant, and invariably the dominant males, whose right is to eat first and take their pick, will chastise them if they get pushy, to teach them their place. Once that is established, things calm down, but youngsters will be youngsters, and not best known for obeying meekly and standing by while their elders eat... so you can expect some further encounters. December squeakers have a disadvantage: born late in the year, they find it hard to get plentiful food supplies, and they barely have their full feathering before the cold sets in. In cold countries, they often don't make it, but in Lisbon temperatures are mild, and if they can get food they'll be fine. Not only that, they'll be very strong pigeons! If you take this one under your wing (sorry about the pun!) you will end up with an extraordinary adult, who will always be your friend, and can learn to eat from your hand. All but one of my visiting pushy squeakers have turned out to be males, and when they're in the park with the feral flock, you can tell them apart straight away by their size and confident stance! Sweet! I believe Titan is also very young. He has grown quite a bit since he first started visiting, and I don't think an older pigeon would befriend a human this quick. One day after meeting me he was already eating from my hand without a care in the world. He doesn't seem to like being touched though - he complains with a growl-like noise and slaps my hand away . I bet they can see your wings! PS. What Titan did is known in the business as 'wingslapping'! Even tame pigeons do it, when they're nesting and don't want your hands too near the eggs! Or in this case, his food huh? Best wishes to you too, Nilay! If we don't hear from you before, have a wonderful Christmas! I've come across a problem and I'm unsure on how to handle it...About four days ago RR got into a fight with another pigeon and the next day his left eye was half closed. Two days ago it was 2/3 closed and yesterday it was fully closed and swollen. I've been thinking about taking him to the vet but it's pretty much impossible for me to get a hold of him because he doesn't go infront of the window (while it's open) even if that's where the food is. Anyway, today as I fed him I noticed that his eye is about 1/3 open again and is still not seeping any fluid (which I'm assuming is a good sign), but the inside of the lid looks a bit red. What should I do about this? Do you think his eye is healing on its own? It sounds like his eye is starting to heal. Don't expect it to exhude any liquid -- pigeon's pus isn't liquid, it's yellow and hard like a bit of plastic, and whenever it's present in a wound either it falls off of its own accord when the wound heals, or else it has to be surgically removed by a vet. However, at a push, you can still slip him meds if he's feeding on his own. If you can get hold of Baytril 150mg tablets (you can buy them over the counter at any pharmacy), cut up a little bit as close as you can get to a cube with 1mm sides, then get a tiny bit of soft bread and roll it around the med to form a little ball the size of a small pea -- give him that once a day for 5-7 days, and it should help fight any infection. Thanks so much for the help Teresa, I'll go buy that Baytril first thing in the morning! I've been quite restless trying to come up with some devious plan to catch him but it's pretty much impossible given his positioning...*sigh*. I'm very sensitive to animal suffering and seeing him like that has been really upsetting me. I'm glad to know there's still something I can do even if I can't catch him. I'll keep you updated on how he's doing! Hi Teresa, I've been to the pharmacy and I'm a little confused... Is it really the 150mg tablets? Or the 15mg ones? Any strength will do! My local pharmacy is only stocking the 150 mg ones now (they actually work out cheaper), but if you can get the 15 mg, that's easier to dose out, as he'll need half a tablet a day -- it is, however, a bit harder to hide the med in the bread and you may need to divide it between two or more bits of bread.